In this tutorial, you will learn to create a material design dashboard for android application with progressing status. Making dashboard user interface is not much difficult in android but making actual working dashboard is not easy. In this dashboard I have used ProgressBar to show progress activity. Here I have created two different XML files in drawable folder to make circular progress using ProgressBar and I have added RelativeLayout, LinearLayout, ProgressBar, TextView, ScrollView, etc in XML layout file with different attributes. Let’s start by creating new android project with project name: Dashboard UI Design For Android. Firstly, add the following color values in your project res/values/colors.xml file. Now, create two XML files in drawable folder of your project to make circular progress bar. Following is the complete content of two XML files of drawable folder. In XML layout file I have added different RelativeLayout, LinearLayout, ProgressBar, TextView etc. Following is the complete content of XML layout file. 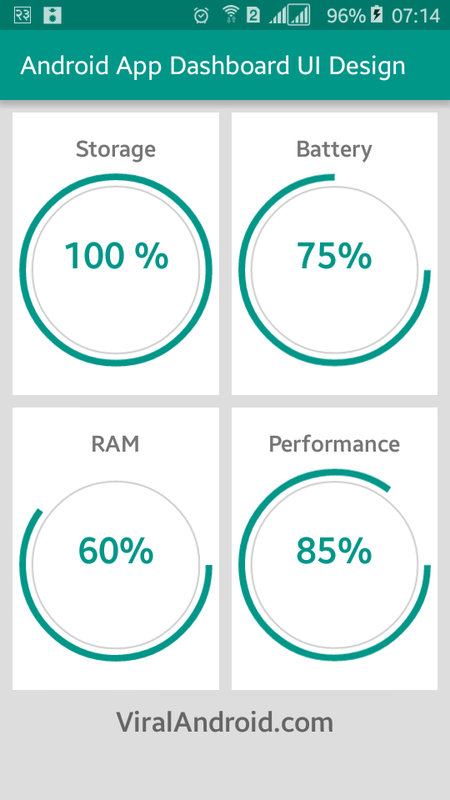 Now, run your Dashboard UI Design for Android application, you will see four different progresses for different topics: storage, battery, RAM, performance in progress bar.